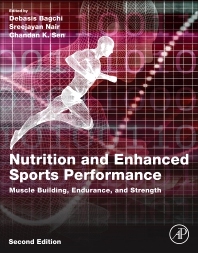 Nutrition and Enhanced Sports Performance: Muscle Building, Endurance and Strength, Second Edition, includes comprehensive sections on the role of nutrition in human health, various types of physical exercises, including cardiovascular training, resistance training, aerobic and anaerobic exercises, bioenergetics and energy balance, and the nutritional requirements associated with each. Other sections cover sports and nutritional requirements, the molecular mechanisms involved in muscle building, an exhaustive review of various foods, minerals, supplements, phytochemicals, amino acids, transition metals, competition training, healthy cooking, physical training, and lifestyle and dietary recommendations for sports performance. This updated edition includes new chapters on mood, alertness, calmness and psychomotor performance in sports, extreme sports, natural myostatin inhibitor and lean body mass, the benefits of caffeine in sport nutrition formulations, the role of vitamin D in athletic performance, probiotics and muscle mass. Dr. Sreejayan Nair is a Professor of Pharmacology and the Associate Dean for Research in the School of Pharmacy, College of Health Sciences, University of Wyoming. He also serves as the Director of the interdisciplinary Biomedical Sciences Graduate Program in the University of Wyoming. Dr. Nair earned his bachelors, masters and PhD degree in Pharmaceutical Sciences from the College of Pharmaceutical Sciences, Manipal, India. He received his post-doctoral trainings at the Department of Medicine-II, Ludwig Maximillians University, Klinikum Grosshadern, Munich, Germany, and at the Department of Physiology, University of Tennessee Health Sciences Center, Memphis, TN. His research interests are diabetes and cardiovascular disease. He has published over 75 research papers in peer-reviewed journals and presented at various national and international conferences. His research has been funded by the American Heart Association, American Diabetes Association, and the National Institutes of Health. He has co-edited three books related to diabetes and cardiovascular disease. He is a Fellow of the American College of Nutrition. Dr. Chandan K Sen is a tenured Professor of Surgery, Executive Director of The Ohio State University Comprehensive Wound Center and Director of the Ohio State University's Center for Regenerative Medicine & Cell Based Therapies. He is also the Associate Dean for Research at The Ohio State University Wexner Medical Center. After completing his Masters of Science in Human Physiology from the University of Calcutta, Dr. Sen received his PhD in Physiology from the University of Kuopio in Finland. Dr. Sen trained as a postdoctoral fellow at the University of California at Berkeley's Molecular and Cell Biology department. His first faculty appointment was in the Lawrence Berkeley National Laboratory in California. In fall of 2000, Dr. Sen moved to The Ohio State University where established a program on tissue injury and repair. Currently, Dr. Sen is a Professor and Vice Chair of Research of Surgery. Dr. Sen serves on the editorial board of numerous scientific journals. He is the Editor in Chief of Antioxidants & Redox Signaling(www.liebertpub.com/ars) with a current impact factor of 8.456. He is the Section Editor of microRNA of Physiological Genomics, a journal of the American Physiological Society. Dr. Sen and his team have published over 250 scientific publications. He has a H-index of 64 and is currently cited 2000 times every year.